Long-lasting concrete means fewer traffic delays due to maintenance work, saving motorists and businesses time and money. Plus, it reduces air pollution caused by traffic stalled for road construction. Concrete’s rigid surface provides safer traction and fewer potholes to help prevent accidents and injuries. Concrete’s excellent light reflectance provides greater visibility and safe travel. Concrete holds up better under commercial traffic—making it the preferable choice for heavy load-bearing vehicles. Concrete pavement lasts longer. 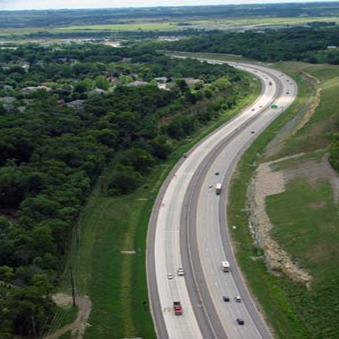 A study conducted at Michigan State University’s Pavement Research Center for Excellence showed concrete interstates lasted nearly twice as long as asphalt counterparts. Concrete, on average, had a life of 24.2 years, while asphalt had an average lifespan of 12.4 years. Research shows that taxpayers spend significantly less to maintain roads over the lifespan of concrete pavements. A report by the American Concrete Pavement Association, “A Comparison of Pavement Performance and Costs, Interstate 40, Tennessee” indicates that concrete pavements provide a 2.1 to 2.5 times longer service life; 13 to 21% lower lifecycle cost; and 11 to 21% better benefit/cost ratio. Still not convinced? Then click here to see the results of a head-to-head test of concrete vs. asphalt on U.S. 30 in Ohio. Concrete yielded better results for taxpayers and drivers. Concrete gives taxpayers more value for their money in every category.